Originally uploaded by Kyle Fox. So, I got a new GPS today, well, it least its new to me. 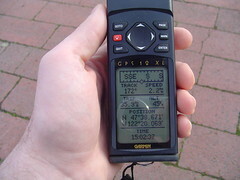 Its a Garmin GPS 12XL with software 2.01. It outputs NMEA 0183 2.0 sentences fine, I think I'm gonna use it for APRS.